just about any pole. We do not sell poles for this type of flag. 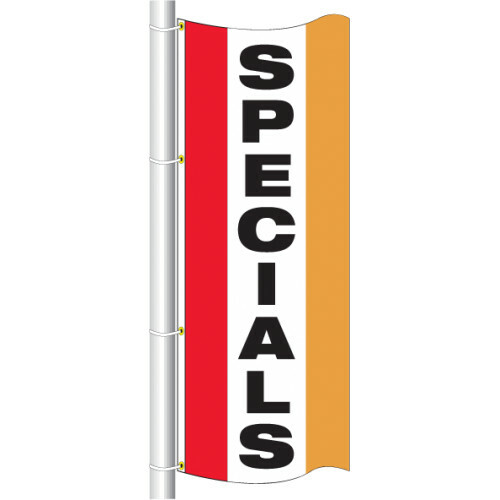 Draw attention easily with with our large drape flags! Each flag is approximately 2 1/2 feet wide x 8 feet tall. There are 4 grommets along the vertical side so you can zip-tie the flag to your existing pole. Great for advertising apartments, rental houses, and mobile home parks. Printed on one side so message appears reversed on the back side. Draw attention easily with with our large drape flags! Each flag is approximately 2 1/2 feet wide x 8 feet tall. There are 4 grommets along the vertical side so you can zip-tie the flag to your existing pole. Great for advertising apartments, rental houses, and mobile home parks. Printed on one side so message appears reversed on the back side. These flags are in stock and will ship on the next business day after the order is placed. We ship priority mail which should arrive anywhere in the continental united states in 3 days or less. Draw attention easily with with our large drape flags! Each flag is approximately 2 1/2 feet wide x 8 feet tall. There are 4 grommets along the vertical side so you can zip-tie the flag to your existing pole. Great for advertising apartments, rental houses, and mobile home parks. Printed on one side so message appears reversed on the back side. 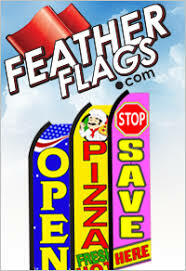 These flags are in stock and will ship on the next business day after the order is placed. We ship priority mail which should arrive anywhere in the continental united states in 3 days or less. Draw attention easily with with our large drape flags! Each flag is approximately 2 1/2 feet wide x 8 feet tall. There are 4 grommets along the vertical side so you can zip-tie the flag to your existing pole. Great advertising for apartments, rental houses, and mobile home parks. Printed on one side so message appears reversed on the back side. These flags are in stock and will ship on the next business day after the order is placed. We ship priority mail which should arrive anywhere in the continental united states in 3 days or less. Draw attention easily with with our large drape flags! Each flag is approximately 3 feet wide x 8 feet tall. There are 4 grommets along the vertical side so you can zip-tie the flag to your existing pole. Great advertising for sporting events, car dealers and more. 100 percent nylon with heavy canvas header. .
Each flag is approximately 3 feet wide x 8 feet tall. 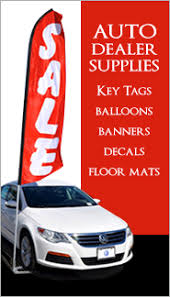 Great advertising for sporting events, car dealers and more. 100 percent nylon with heavy canvas header. This flag pole will NOT work with our 19.00 feather flags. This flag pole is for drape flags. This flag pole is for drape flags. 3' x 8' single sided Patriotic Flags are made of 100% nylon with canvas heading and 4 brass grommets along the 8' vertical side.